U.S. government officials on Monday denounced Venezuelan President Nicolas Maduro's declaration of victory in Sunday's election as a fraud and issued new sanctions designed to prevent Maduro from selling off the country's debt to U.S. entities and individuals. President Donald Trump's new executive order bars U.S. citizens from being involved in sales of the country's accounts receivable when it comes to oil and other assets. However, the Trump administration stopped short of slapping tougher direct oil sanctions against the Maduro regime, a step that opposition leaders have pressed for and was widely anticipated to take place in the wake of Maduro's orchestrated victory at the polls. Targeted crude oil sanctions against Venezuela would cripple Maduro's leftist administration, which is entirely dependent on crude sales to prop up its increasingly isolated and insolvent government. President Trump and top administration officials are wary of taking any action that would further hurt the Venezuelan people, who are already suffering from widespread food shortages brought on by the economic crisis. They also don't want to do anything that could increase domestic gasoline prices, which are already experiencing their annual spike ahead of the summer months of heavy vacation driving. Instead, Pompeo declared Sunday's vote a "sham" and suggested the oil sanctions are still on the table for consideration. "Sunday's process was choreographed by a regime too unpopular and afraid of its own people to risk free elections and open competition," Pompeo said, vowing "swift economic and diplomatic actions." Trump followed up by issuing an executive order prohibiting any U.S. person or entity from purchasing any debt owed to the Venezuelan government or any debt that is pledged as collateral to the Maduro regime. That action followed sanctions the administration announced on Friday against Diosdado Cabello, long considered the second-most powerful governing politician in Venezuela and a top Socialist Party figure, and other top Maduro regime officials. The United States accused Cabello of drug trafficking, extortion, money laundering, and embezzling government money. Sen. Marco Rubio (R., Fla.) applauded the new U.S. sanctions and predicted that Maduro would be forced out of power as his country's economic crisis continues to spiral. "Nicolas Maduro told his supports that pulling off a fake election would be a reset that would result in less sanctions and less isolation," Rubio said Monday in a statement. "Instead he faces more sanctions and is more isolated than ever. Maduro's days in power are numbered." Rubio called on leaders of the governing party to remove Maduro and the other criminals from power and create a process for national reconciliation and restoration of the "constitutional democratic order" before "time runs out on them as well." Others continued to press for oil sanctions, which they argued would have the most impact in forcing Maduro from power. Enrique Altimari, an anti-Maduro activist who serves as the Latin American Studies fellow at the Victims of Communism Memorial Foundation, said the Maduro regime would start to feel oil sanctions in three weeks and the financial damage would be unbearable by the third month. "Oil is usually bought in advance, so the impact would be immediate, and within three months, the government would be already seriously damaged," he told the Washington Free Beacon. "The opposition would use, not only for international pressure, but internal pressure to hopefully start a true dialogue to set the terms for [Maduro's] way out of government and out of Venezuela." Altimari also argued that oil sanctions would not intensify the suffering of the Venezuelan people because the Maduro regime uses the oil income to pay itself and the military. "The money is not getting to the Venezuelan families, whatsoever, only to the military and the politically elite—it's the resource the regime uses to survive," he said. "If you take away those funds, you would put him in a very uncomfortable position—he will be unable to pay his payroll of lackeys and people in the military, and they would lose incentive to maintain the Maduro government." On a conference call with reporters Monday, a senior administration official said Trump isn't taking any option off the table, including oil sanctions and a more drastic option of the use of military force. A senior Trump administration official said that 95 percent of the Western Hemisphere is now united against the Maduro regime. "Everybody is truly together on this—there is unity in the hemisphere that is almost unprecedented" in how to deal with this "crisis of democracy." "The region has never seen a kleptocracy like this—a nation as wealthy [as Venezuela is] driven into an economic death spiral so quickly by such a group of individuals determined to enrich themselves at the expense of their people," the official said. The official estimated that nearly 1.5 million Venezuelans have migrated to nearby Colombia and Brazil, a flood of refugees rivaling the exodus of migrants from Syria during the course of the nation's years-long bloody civil war. The United States has provided more than $40 million to help Colombia and other countries in the region deal with the outflow of Venezuelans into nearby countries. U.S. government officials also condemned the Maduro regime's exploitation of the scarcity of food and basic necessities by setting up food stations near polling places and doling out food after presenting their voting cards for inspection, so party organizers can see who voted and who has not. 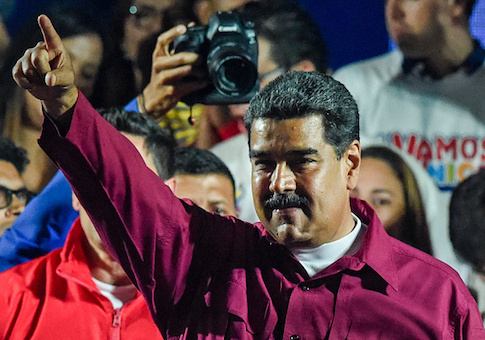 "Everyone who has this card must vote," Maduro open said at rallies before the election. "I give, and you give." Along with the United States and Canada, a group of 14 nations in the Western hemisphere on Monday reacted to Maduro's claims of winning a new six-year term by pledging to limit diplomatic ties and blocking all future loans to Venezuela. The group of Latin American nations, known as the Lima Group, issued a statement saying it "did not recognize the legitimacy of Sunday's vote. The members said they had agreed to take steps so that national and international banks would not offer loans to the Maduro regime unless they had approval from the opposition-held National Assembly. The Maduro government tried to dissolve the National Assembly, which was elected in 2015, and set up a National Constituent Assembly full of supporters to usurp its power. The Lima Group members also said they would recall their ambassadors for consultations about reducing their diplomatic communications with the Maduro regime. The group is made up of Argentina, Brazil, Canada, Chile, Colombia, Costa Rica, Guatemala, Guyana, Honduras, Mexico, Panama, Paraguay, Peru, and Saint Lucia. This entry was posted in National Security and tagged Nicolas Maduro. Bookmark the permalink.